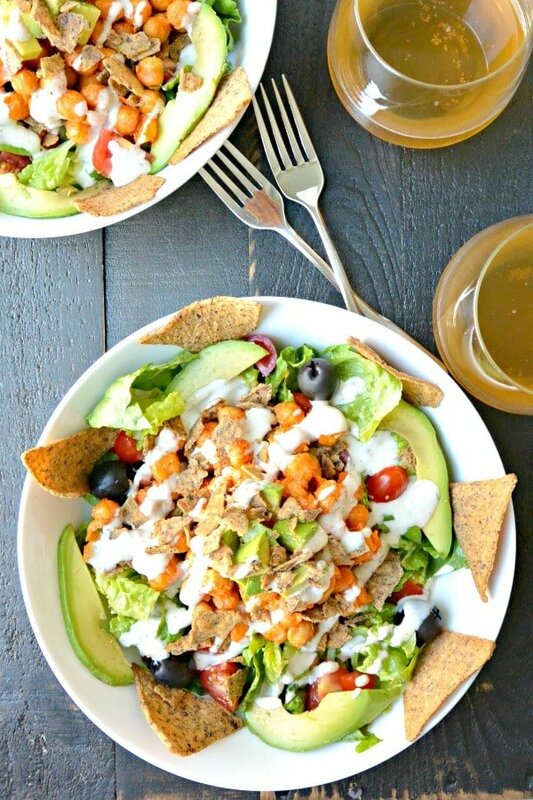 Buffalo Chickpea Salad with Ranch combines tangy and spicy flavors with crunchy tortilla chips and cooling Ranch dressing in a satisfying main-dish salad. This recipe is vegan and gluten-free. Thank you to Beanfields for sponsoring this post. All opinions are my own. I love a hearty salad that’s filling enough to be a meal. And I’ve always been fond of beans in salads as source of protein and fiber. 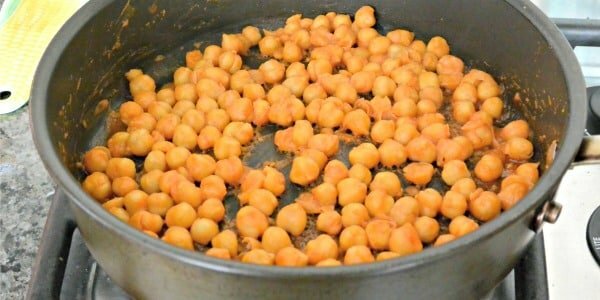 If I had to choose my favorite legume, it would have to be the chickpea, also known as the garbanzo bean. Sometimes I add plain beans to my salads, but I really enjoy them Buffalo-flavored with dairy-free Ranch dressing. And I think once you try the combination in this Buffalo Chickpea Salad, you’ll be hooked, too! Buffalo sauce is often associated with Buffalo chicken wings, which originated in a bar in Buffalo, New York. The article Why Buffalo Wings Are Called That explains the history of the fried wings served in a spicy sauce. These days, it’s common to see other uses for the buttery cayenne pepper sauce, such as in Buffalo Cauliflower Bites Salad. Often commercially sold Buffalo sauce is not vegan since it contains dairy products such as butter. I make it a habit to always check the labels when I shop. But it’s easy to make it yourself with your favorite hot sauce and some vegan butter or buttery spread. My go-to hot sauce when making Buffalo Chickpea Salad is Frank’s RedHot Original. Chips add the perfect crunchy texture to this salad. I love using crushed tortilla chips in taco salads. That’s why I partnered with Beanfields, the maker of my favorite healthier chips, to bring you this Buffalo Chickpea Salad. Besides being delicious, they are vegan and certified gluten-free, plus they are non-GMO Project Verified, which is very important to me. They come in a variety of flavors such as Sea Salt, Barbecue, and Nacho. For this recipe, I decided to use Pico de Gallo. However, any flavor of Beanfields would work, such as Jalapeno Lime or Cheddar Sour Cream. 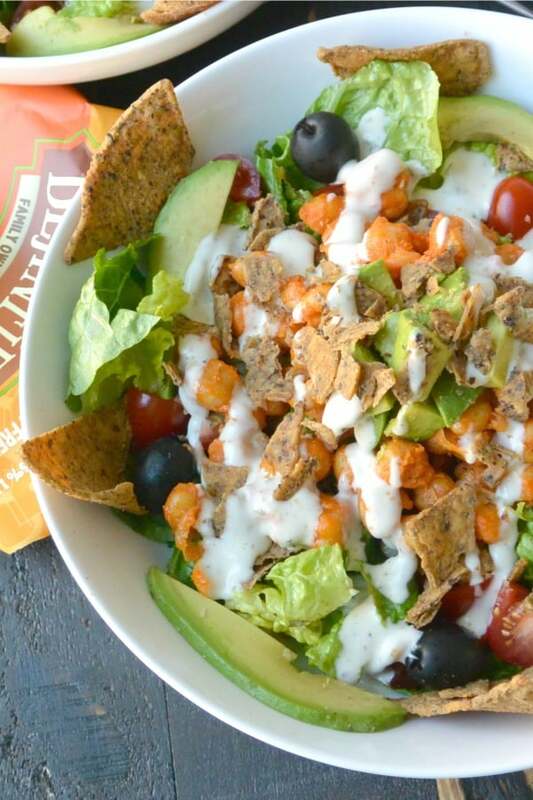 How to make Buffalo Chickpea Salad with Ranch. This salad comes together very quickly making it perfect for lunches and weeknight dinners. Melt a little vegan butter in a skillet. Then add the chickpeas and hot sauce and saute for a few minutes, stirring occasionally, until the sauce has thickened. Meanwhile, prepare the salads in individual bowls. For toppings, I like using avocado, cherry tomatoes, and olives. Divide the seasoned garbanzo beans among the bowls. Crush some chips on top of each. Serve the salads with either store-bought dressing or my favorite Cashew Ranch Dressing and enjoy! This recipe takes under 30 minutes to make. If you want to make it in advance or take it on the go, store the Buffalo chickpeas, chips, and dressing separate from the lettuce and vegetables. When you’re ready to eat, you can combine the elements all together. 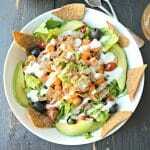 If you love this recipe for Buffalo Chickpea Salad, please give it 5 stars! 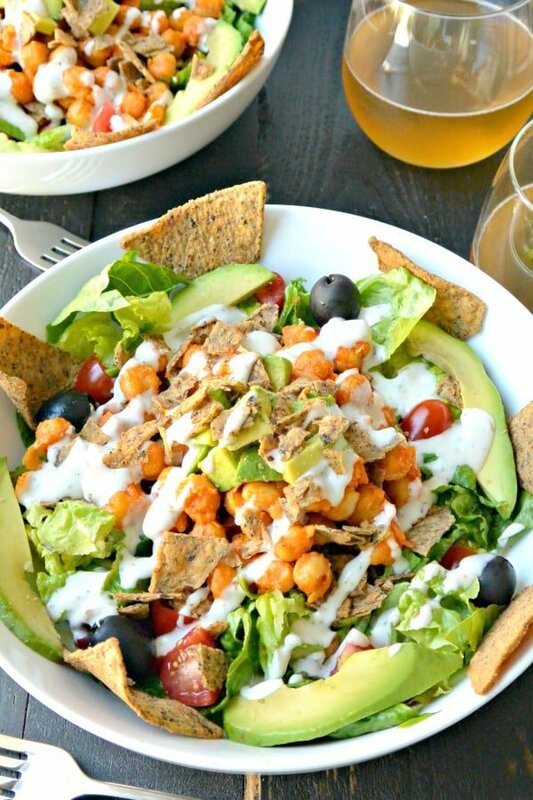 Buffalo Chickpea Salad with Ranch combines tangy and spicy flavors with crunchy tortilla chips and cooling vegan Ranch dressing in a satisfying main-dish salad. Melt the vegan butter in a skillet over medium heat. Add the chickpeas and cayenne pepper sauce. Stir frequently until the sauce is thickened, about 5 minutes. Remove from heat and set aside. Assemble the salads in two large bowls. Add the lettuce on the bottom, then top with the tomatoes, avocados, and any other vegetables you are using. Divide the chickpeas among the two bowls. Crush the Beanfields chips in your hands and sprinkle over the salad. Drizzle with Ranch dressing and serve right away. Enjoy! Please note: Nutrition Facts do not include the chips or Ranch dressing. Refer to the packaging for details. For homemade vegan Ranch, make a batch of oil-free Cashew Ranch Dressing. This is sooooooo delicious!! I didn’t have any chips on hand and it was stillsuper yummy. Quick and easy, this will definitely be in our rotation! Thanks Michele! I’m so glad you enjoyed it!